He went on saying: “We will continue to support the coalition operations in Syria, to ensure this permanent defeat,”. After defeating the terrorist ISIS, the forces of Qasad organized a military parade of its forces, sending “messages” through internal messages to the “Syrian regime” and external to neighboring countries, especially Turkey and Iran. And the question that arises in this context, who is “Qasad”, and how it was allied with the United States of America?! 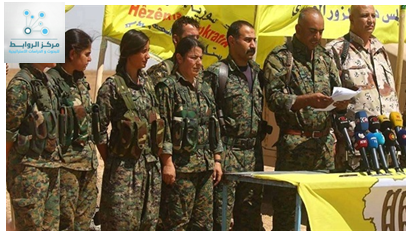 The Kurdish People’s Protection Corps (PKK), and Women’s Protection Units, armed forces belong to the Kurdish Democratic Union are the backbone of Syria’s democratic forces known as Qasad. The events were accelerating in the north of Syria and the roles of a group of players are numerous, notably the Kurdish fighters, the United States, Turkey, Russia and the Syrian regime. The United States was in need of an ally in northern Syria to strengthen its influence there, to confront the “ISIS ” on the one hand and to increase its pressure on Bashar Assad’s regime, and to confront the Russian-Iranian expansion, so the chose Kurdish fighters who saw Washington as a military force to help them to confront their adversaries and they also saw them as a political ally that would give them a greater role in Syria’s future, whether Bashar Assad’s regime is going to continue or not , noting that there is a kind of convergence between the Kurds and Bashar Assad ‘s regime in the face of “Daesh”, , as the Kurdish National Council, consisting of several Kurdish parties, is within the Syrian opposition coalition. The United States provided very large quantities of weapons, equipment and logistical support to Syria’s democratic forces, including anti-tank missiles, mortar projectiles od different calibers , light and medium weapons and armored Hummer vehicles. So it was no surprise that US soldiers had been photographed since May 2016, carrying the slogan of the People’s Protection Units, as part of a military operation with Syria’s democratic forces. Washington was satisfied with the formation of these forces mainly from the Kurdish fighters, while turning a blind eye to the links Between the Democratic Unionist Party and the PKK, since its endorsement of these links may make it accused of supporting an entity coordinating with a terrorist organization. This has been aided by the first party’s attempt to claim its independence from the latter, although those who follow the matter are aware of the depth of historical relations between the two sides. they added , Washington is willing to be a region of northern Syria as a model for the rest of the Syrian territory, especially as the region extends over 40,000 square kilometers and has strategic importance for Washington, and the latter is aware that there is a challenge in the phase after ISIS that requires the continuation of military support, especially the return of displaced persons and the continuation of pockets of “ISIS “, as well as the confrontation of the aspirations of the Syrian and Iranian regimes to seize the Kurdish areas. Therefore, Turkish threats will strain Ankara’s relations with Washington, especially since the latter knows that the Kurdish fighters will respond to any Turkish attack on them in the future. An analysis of the Washington Institute for Near East Policy, under the title : “Managing the Transformation of US-Syrian Kurds Relations,” that the importance of maintaining the relationship is rooted in Washington’s desire to exert influence in Syria, the possibility of ethnic conflicts in the country after the phase of ISIS and the confrontation the Iranian hegemony which threats the regional goal of USA ” but the American support for Syria’s Kurds, the analysis adds , must be conditioned on democratic governance by avoiding restrictions on non-Kurdish components in northern Syria, as well as distancing themselves from the PKK, avoiding “symbolic provocations” “as happened when pictures of Abdullah Ocalan were raised in al-Riqa after its liberation. The US statements came against the backdrop of continuing Turkish threats to launch an offensive to expel the Kurdish factions from its borders, as well as the Syrian government’s desire to regain control over its entire territory. In this context, the banner of messages sent by Qasad immediately after the declaration of the military victory over ISIS , to Ankara and Damascus together where it called the first for withdrawal from the entire Syrian territory, and the called the second for recognition of the administration it established in areas under its control. In this context, the most prominent challenge faced by these forces in the previous period was the American announcement of the desire to withdraw the military forces from Syria, before Washington retreat from this step later, where it was announced to keep small groups, in order to encourage the rest of the members of the International coalition to counterterrorism to take similar steps, which has pleased the Kurds, given that the US withdrawal could have been a prelude to Turkish interference in the areas controlled by the ” Qasad”. In the opinion of the regional observers, the Kurds of Syria are well aware that there is no future for their political project without American support, since what it carries contrasts with the orientations of many regional powers active in the Syrian events, notably Turkey and Iran, and with the return of Kurdish anxiety following the announcement by US President Donald Trump withdrew his troops from Syria, Qasad tried to revive the negotiations with the Russians and the Syrian regime before the US response came quickly by the head of the international coalition forces Paul Lacamira, who threatened that Washington would have to stop its military assistance to the “Syrian Democratic Forces” in case of its alliance with Syrian regime and Russia , the issue which has hindered all movements of Qasad and obstructed any political movement of the Kurds in this field . Syrian Foreign Minister Walid al-Moallem accused the Americans of sabotaging last year’s negotiations between the Kurds and the regime, in which the Kurds called for “democratic decentralization” and circulated as a form of government in Syria. In a television interview last month, al-Moallem said Washington had sabotaged the talks between Damascus and the “Syrian Democratic Council” and provided military support. it was an accusation which was considered by many to be largely true, as the Kurds returned to link the political solution in Syria with America’s declared priorities, namely, the elimination of the organization of “da’ash” and the removal of Iran, and then put forward a political solution. Undoubtedly , , the Qasad declaration of victory over the terrorist organization of ISIS in the region of Eastern Euphrates formed a decisive event in which the fate of these forces are not distant from it , it is noted that the statement of victory over ISIS included the call of the “Syrian Democratic Forces” for the Syrian regime to recognize the ” Self-management “established in its areas of control, in clear reference to its awareness of the magnitude of the risks it faces and its willingness to negotiate the regime. While Qasad still has power cards that may allow it to play a new role in the conflict with Syria, the overall character of the Syrian Democratic Forces is purely Kurdish. More than three years later, Qusd has tens of thousands of trained fighters with medium and heavy weapons provided by the international coalition, making them a force to be reckoned with in any conflict that may erupt, especially with the forces of the Syrian regime or the Turkish army in case the United States has lifted the protective cover for these forces. It is expected that the Western support of Qasad will continue in the foreseeable future, as long as there is a danger of a return of “ISIS” again, which explains the insistence of the Kurdish leaders in these forces to remind the world that the danger of the organization is not over yet. This came with the arrival of US military aid to the “Qasad” in Al-Hasakah, coming from the Kurdistan region of Iraq, and these forces have power cards that can prolong its life more, including the fate of thousands of militants surrendered from the organization, “Daash,” as it is expected to pass a long time before closing this thorny file. These forces tried to exploit the tension between the Turkish side and Arab countries, including Saudi Arabia and the UAE, by facilitating a military presence in the north-east of Syria, which guarantees Arab support for the Kurds hich allows for them to enter strongly into any future political settlement in which the Kurds hope to guarantee them constant political and cultural rights to avoid them of future retaliation may be hidden by the current system. The “Syrian Democratic Forces” have begun to prepare for a phase after ISIS, taking into account a number of political factors in a highly complex Syrian scene that is further aggravated. While the Syrian Democratic Forces were the spearheads in the battles against the terrorist ISIS and paid high price until the liberation of more than one third of the area of Syria from the radical organization stressing the killing of more than ” (11000) of its fighters since the beginning of the process of “confrontation of ISIS ” in late 2015, it is well aware of the seriousness of the next phase, whether its fate or outstanding issues at some point after the end of the organization’s control. Under the title of “Challenges after the elimination of ISIS ” the leader of Syria’s democratic forces (Qusd), Mazloum Abdi , who fought the organization in northeastern Syria with great US support, wrote that despite the defeat of the organization on the ground, it is still a threat to Syria’s stability. He told the D. Post Site that with the liberation of the town of Baguoz from the control of the terrorist organization, successfully closed the last chapter of the story of ISIS. After the evacuation of a large number of civilians from the town of Baguoz and the surrender of hundreds of extremists, Syria’s democratic forces, with the participation of the International Coalition , intensified their fight against remnants of the terrorist organization and declared to the world the destruction of the so-called Caliphate .In the opinion of the writer, there is no doubt that the elimination of the terrorist organization was the result of the efforts and sacrifices made by the Syrian democratic forces and the coalition. High-level coordination among the parties concerned, with their strong ties, will end a nightmare for the world and turn the region into a hotbed of terrorism. According to Abdi, by making joint decisions between the forces and the coalition forces, cities were liberated, one by one, as well as avoiding civilian casualties through the use of precise military tactics. Abdi says US President Donald Trump’s decision to keep some US troops in Syria is crucial for the next phase of the fighting against ISIS , which involves rooting out his ideological roots, which require long-term and sustained action. Therefore, from the very moment of announcing the defeat of the organization, Qasad seemed to be keen to stress that it could not face these challenges – the fate of the remnants of the terrorist organization ISIS, the Turkish safe zone, the Syrian regime’s dream of regaining control of the liberated areas, the desire of Iran and Russia to expand their influence in Syria – alone, especially as it stands today at a difficult crossroads in a very complex regional environment.